I wanted a beer that I could give out at parties and wouldn't fill you up so you could drink it while playing beer pong or some other irresponsible method of drinking. This beer needed to be something all people could drink and not have a problem drinking a lot of it. I chose to go for the taste of a macro brewed rice beer. I know I will not be getting any brewing street cred for this but this beer is mostly for my friends and their girlfriends, this is a Party Beer. This should give a starting gravity of about 1.040. 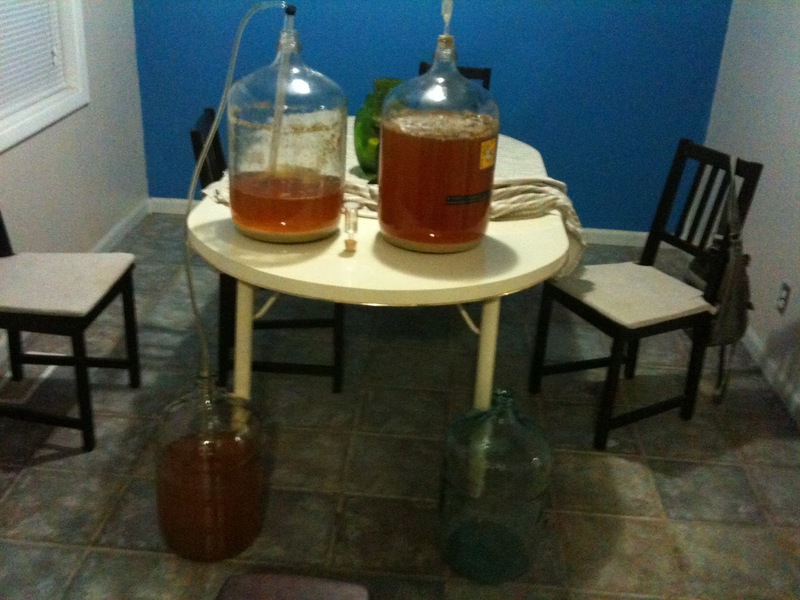 Sunday November 13 was brew day. I started with 5 gallons of water in my mashtun which I then heated to 165 °F so that when my grains were added it would drop it down to around 155 °F. This was a cold day so my calculations were a bit off the grain dropped the temperature down close to 150 °F. I needed to heat it up a little bit to activate the correct enzymes and convert the starches, so I turned on the burner under the mashtun. I walked away for a second do go do something else. Mistake. After about 10 minutes of the mashtun burner being on I remembered that I needed to turn it off. By this time it was too late the temperature had soared to 185 °F far above the correct mashing temperature and into the tannin extracting realm. This was devastating. I quickly tried to cool the mashtun by spraying water on the kettle and taking the lid off to stir. This did not cool it enough. If I were level headed and a little more experienced with all grain brewing I would have simply added some cold water to the mashtun and cooled it easily to a reasonable temperatue. But I wasn't so I just let it mash out at that temperature. Idiot. I cooled the wort, pitched the yeast into two 6.5 gallon carboys. Fortunately I got my mash and sparge water volumes correct this time so I cam out with almost exactly 10 gallons of beer post boil. I took the gravity reading and it turned out pretty close to projected. I will have to see if there were too many tannins extracted during mashing hopefully this will be drinkable. Fermentation had slowed down significantly by Friday November 18th so I transferred and took a gravity reading. I would be lying if I said I wasn't a little disappointed at this reading but it has been cold lately and maybe the fermentation is just slow. Hopefully it will finish out faster in the secondary. 131.25*(1.035-1.020)=1.98 Weak sauce I hope its at least drinkable probably won't be. This is weaker than bud light. I definitely will not be using this recipe again in lieu of a crappy lager wannabe I will try a Kolsh next time.